3 Blind Mice has been nominated as the Best in San Diego for the Window Coverings / Shutter Company category at the Union Tribune. Now we need the support of our local community to help us win this award! We want to dedicate this nomination to our devoted staff for their long hours, extra effort, and assurance that we maintain high levels of customer service. Without their quality work, we would not be able to achieve this success! To vote: visit the For the Home voting page and click on our name in window coverings category. Voting is quick, easy, and will only take a minute to help us out in a big way. 3 Blind Mice is nominated in the sub-category for best Window Coverings / Shutter Company. Voting ends June 26, 2017, but you can vote once every day. So now is a great time to get started! Customer satisfaction is a staple to our business success and helped us become one of the fastest growing companies in San Diego. 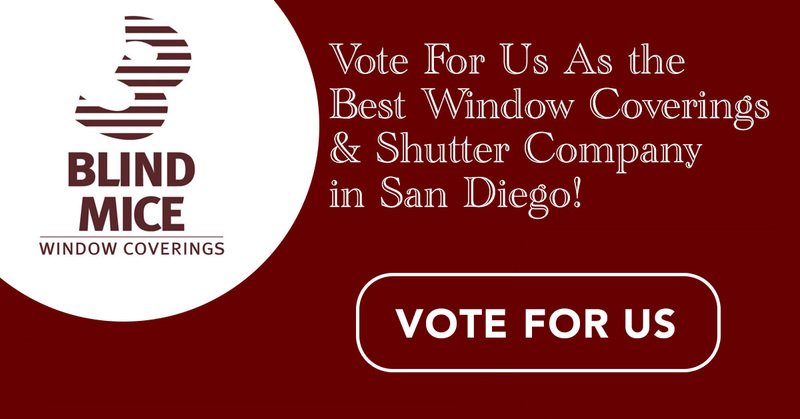 If you agree that we provide a quality service, please vote for us and help our company grow to offer even better window coverings and shutter services in San Diego. Now that we have the chance to be named the Best in San Diego for 2015 let’s not stop there. Thank you for your help taking 3 Blind Mice to new heights to once again exceed expectations.